The Canterbury Television (CTV) Building collapsed during the Lyttelton Earthquake in February 2011 tragically taking the lives of 115 people. Compusoft Engineering was responsible for the inelastic time history analyses used as part of the forensic investigation into the collapse. Results were used to determine trends in building behaviour, the likely failure hierarchy, and to investigate the effects of cumulative damage resulting from sequential earthquakes. Best practice and the latest research was used to determine the likely performance of the structural elements. This combined with state of the art modelling techniques produced results that were consistent with collapse hypotheses and physical evidence. Non-linear behaviour incorporated into the analysis included, frame hinging, wall yielding, rocking, diaphragm disconnection, floor yielding (in and out of plane), beam column joint behaviour, and masonry strength and stiffness degradation. Compusoft Engineering was engaged by Genesis Energy to undertake seismic assessment work related to a number of assets that are part of the Tekapo A hydroelectric scheme. As part of the overall engagement Compusoft Engineering was tasked with undertaking an independent review of a seismic assessment of Gate 16, which is a control gate forming part of the Tekapo A scheme. The concluding report detailed the independent analysis and assessment undertaken to verify the expected earthquake performance of the Gate 16 structure during both the serviceability limit earthquake (SLE) and maximum design earthquake (MDE). A three dimensional finite element analysis model was formed in the software package SAP2000. Compusoft Engineering was engaged to design seismic strengthening to an 'L-shaped' apartment tower with a building footprint of 42m x 36m and height above ground of 36m, located in central Auckland. The client brief has specified that the retrofit works should ensure that the building can attain a percent new building standard (%NBS) score not less than 67 as defined by NZSEE. 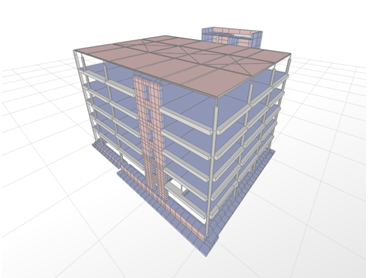 A seismic analysis of the building was undertaken using the finite element package ETABS via the nonlinear time history analysis procedure in accordance with the requirements of the New Zealand Loadings Standard,. The strengthening works included; strengthening to the Level 1 & 2 diaphragms, wall alterations to ensure diaphragm actions are not exceeded and foundation strengthening including additional piles and ground beams. Compusoft Engineering was engaged by Damwatch Services Ltd. (DSL) to undertake a detailed seismic assessment of the Mangatangi Dam spillway shaft. The assessment was a continuation of a previous study that had shown that the spillway shaft was likely to exhibit inelastic behaviour when subjected to ground motions corresponding to return periods of 2,500 years and 10,000 years for the site. Provide estimates of (horizontal) crack widths likely to be present during and following each of the seismic events to allow determination of whether cracking is likely to induce significant leakage. This was achieved by the use of inelastic time history analyses utilising the advanced finite element analysis package SAP2000 for the spillway shaft. The hotel suffered minor to moderate damage during the Canterbury earthquake sequence ongoing since 2010. Compusoft Engineering was engaged to determine, through the use of specialist software and inelastic time history analysis, that the hotel building could achieve New Zealand Standard accepted seismic performance post-earthquake.